Ieniemienie loves to make plans and play around the street. She also loves to hang out with Pino – me will tell you more about him next time! – who is really tall. When she is angry you can see her nose scrunch. When she is confused she will shrug her shoulders. But most of the time she is a happy little mouse with a very distinctive giggle! O and when you are her friend you can just call her Ienie. Me like her very much. Me like Ienie and her friends. On Youtube you can watch them play all kinds of fun games. 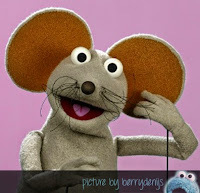 Make sure to search for Ieniemienie and Sesamstraat and enjoy Dutch Sesame Street!